Government is hoping for the best, but bracing for the worst as the CCJ could come down with another hammer blow judgement against them Wednesday morning. 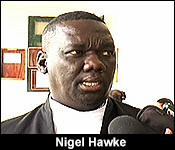 The case is the matter of the Belize Bank Ltd. vs. The Attorney General - and that 90 million dollar award plus interest for Universal Health Services. 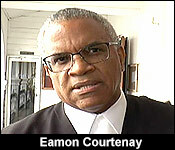 We showed you arguments from both sides last week when they appeared at the seat of the Court in Port of Spain, Trinidad. Well, Wednesday is judgement day. At 9:00 am Belize time, the court will pronounce on whether it will direct the Minister of Finance directly to pay the 91 million dollar ward - which the court has said is enforceable. The Government has held that it is strictly a matter for parliament to decide, not the Executive, or the Minister of Finance. If the government loses, it would be considered a costly and consequential defeat - after some months of evasion and grandstanding. If they win, they live to fight another day - and allow parliament to decide if it will pay. And while that's what the Bank is asking for, the Government is asking the CCJ the adjust the interest rate down from 17% to 6%. The Attorney General of Belize has succeeded before the CCJ in his application to reduce the interest rate contained in a certificate issued by the Court. The certificate was made following an arbitral award made against the Government. A rate of interest of 17% compounded monthly was initially awarded in the 2013 arbitration award of BZ$36m made by a tribunal of the London Court of International Arbitration against Belize in favour of the Belize Bank. In November 2017, the CCJ gave permission for the Bank to have the arbitration award enforced as if it were a judgment. Following the CCJ’s 2017 ruling, the Bank requested a certificate under s 25 of the Crown Proceedings Act from the CCJ’s Registrar to detail the amount of money owed to the Bank by Belize. The certificate was duly issued in January 2018. According to the certificate, the debt stood at BZ$91.6M as at 15 December 2017, with interest “continuing to accrue at 17% compounded monthly until the date of payment”. The Attorney General applied to have that rate reduced from the date of the certificate. The Attorney General argued that the applicable interest rate was the 6% permitted under Belize law on all judgments in Belize. The Bank countered by suggesting that the CCJ’s November 2017 order was final. The Caribbean Court of Justice this morning issued judgment on the first part of a three-part application and counter-application by the Government of Belize and the Belize Bank Limited. The Bank is seeking that the Court enforce its judgment of November, 2017, in its favor for re-payment of a thirty-six million dollar loan initially granted to Universal Health Services, guaranteed by the Government. 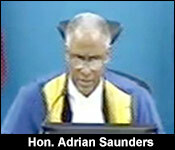 Last week, the two sides were in Port of Spain arguing their case at the C.C.J. headquarters. G.O.B. sought a reduction of the post-judgment interest rate from seventeen percent compounded to the statutory rate of six percent, which the C.C.J. panel gave. But according to the Bank’s attorney, Senior Counsel Eamon Courtenay, there was an offer made to Government in February to pay in installments and at a lower interest rate than offered today. The Government’s attorney says it is all moot, but is it possible the total payment could have been kept down? We have both sides speaking after the panel handed down its judgment. But what happens to the rest of the case? That is still being deliberated by the C.C.J. panel. A large part of it has to do with how Government reacts during Thursday and Friday’s Budget Debate and afterward – but at the moment, according to Bank attorney Eamon Courtenay, no one, including himself, knows what the Government’s plans are. News Five has been informed that the interest accrued to date on the ninety-one point five million Belize dollar judgment since December seventeenth, 2017 amounts to approximately one point nine million Belize Dollars. Today was supposed to be judgement day for the Government of Belize in the 90 million dollar case with the Belize Bank - but it turned out to be not such a momentous judgement after all. That's because the court only gave a partial decision on the rate of interest added unto that 90 million. It did not make any pronouncement on what the bank asked for, which is an enforcement order against the Minister of Finance and the Attorney General, forcing them to pay the judgment debt. So, while everyone waits on that, in the matter of the rate of interest, Government wanted the CCJ to reconsider whether the judgment should have a running interest of 17.6% compounded, or a simple interest of 6%. "This is the application made by the Government of Belize in relation to the post-judgment interest. In the circumstances, this application succeeds. The applicable post-judgment interest is the statutory rate of 6% simple interest from the date of the certificate. Given that the 3 applications were heard together, and we have not yet formed a view on the other 2 applications, the issue of cost is reserved." "The court decided today that the interest rate that is applicable is 6%, which is set out in the statute, and not the 17% that was stated in the award. So, that that run from the date of the certificate, which was in November of 2017." "We made an application on the issue of interest, post-judgment interest. We were arguing that it should be at the rate of 6%, instead of at the rate that was agreed in the award, which was 17% compounded, and the court agreed that since it was now leave to enforce the award, it should be at the rate of 6%. Our position has been vindicated." "Sir, this one loss for your side. Do you think that this is any indication as to how the other 2 may go?" "I don't know why you described it as a loss. I think one of the things that people should realize is that on the 1st of February, the Bank wrote to the Government of Belize offering 2 things: firstly to accept payment over a period of time in installments, and secondly, to accept payment at the rate of treasury notes that were issued by the Government. My information is that the rate that was payable on those treasury notes was about 3.75% to 5.75%. So, the offer that we had made was at a less interest rate than the court is enforcement. So, once again, I believe the Belizean people are paying a higher interest rate, 6%, than the Bank was prepared to accept. To, your second question, I don't think that the question of interest has any indication at all as to the court's decision on the jurisdiction issue." So, as you heard, this is 1 of 3 applications heard last week, and still outstanding is the big issue of whether or not to enforce the judgment against Belize. No date has been announced for that - and we'll tell you when it is.